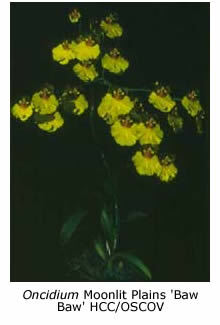 Oncidiums are orchids of the Americas, their habitats ranging from Florida south to Argentina. 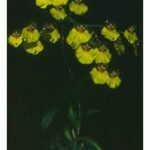 Oncidium is a very diverse genus with over 400 species that grow at altitudes between sea level and 4000 m. In this article I will deal with the varicosum- and crispum-type hybrids. 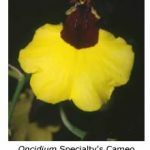 A feature of these oncidiums is the large, fully brown or yellow labellum. These easy-to-grow orchids are often called Dancing Ladies. Most hybrids are the result of crossing O. varicosum, O. crispum, O. forbesii, O. gardneri, O. flexuosum, O. marshallianum and O. enderianum. These orchids originate in the Organ Mountains of Brazil at altitudes between 1000 m and 1500 m, and they are therefore well suited to cultivation in cool climates. When well grown they produce spectacular floral displays. Housing. The above oncidiums may be grown in a cold glasshouse or in a frost-free shadehouse that has a solid roof to provide shelter from winter rain. However a glasshouse heated to a minimum temperature of 8°C will cause new growths to initiate earlier and will result in larger pseudobulbs and better flowerings. Oncidiums love plenty of fresh air, which can be provided by opening the door and roof vents and using an oscillating fan for good air circulation. The level of light should be about the same as that provided for cymbidiums. At the beginning of October I put a layer of shadecloth (shade factor 50%) over the white fibreglass roof and remove it at the end of April. Potting. Oncidiums can be grown either in pots or by tying them to tree fern slabs or wooden logs. Another way is to grow them in wooden baskets packed with chunks of tree fern. With pot culture it is important to choose pots with good drainage. I usually punch extra drainage holes in the sides of my pots to aid aeration of the root system. Oncidiums should be repotted when the new growths are developing new roots, which usually happens in springtime. If possible, the newly developing growth should be positioned in the centre of the pot, so that the plant has room to grow for two years before it needs repotting again. Good quality, chunky bark should be used. A stake should be inserted to steady the plant, because a wobbly plant will never develop a good root system. I prefer to use either mounts or wooden baskets and mount my plants on pieces of tree fern, cork, English oak (Quercus) or paperbark (Melaleuca). Twistie ties or fishing line can be used to tie the plant to the middle of the mount, which should be about 500 mm long to allow plenty of room for the roots to ramble. When wooden baskets packed with chunks of tree fern are used, the roots rapidly penetrate the tree fern. The mounts or baskets can be hung from the roof using hooks or wire. Under favourable conditions oncidiums develop extensive root systems, which will stay in good condition for many years if mounts or baskets are used, although this is not always the case with pot culture. The only disadvantage with mounted plants is that they need watering more frequently than do those in pots. Watering and Fertilising. Varicosum-type oncidiums are seasonal growers, subject in nature to wet, warm summers and dry, cool winters; they should be treated the same way under cultivation. In the case of mounted plants I begin watering regularly when the plant begins to develop new growths in September or October. It is important to water them thoroughly, rather than simply spraying the plants as you walk by. The colour of the roots should change from white to grey-green when they are wet, and I like to see a droplet of water hanging from each root tip. During hot weather and when plants are producing flowering spikes, mounted plants should be watered as often as possible. Flowering usually occurs in April, May or June. After flowering, watering should be reduced to once every seven to ten days. It’s natural for the pseudobulbs to shrivel a little during dormancy – they soon become plump again when normal watering is resumed in spring. The same principles apply to pot-grown plants, although watering should not be as heavy. It’s better to let the bark dry out a little between waterings, because crispum- and varicosum-type oncidiums can lose their roots if the potting medium is kept continually wet. 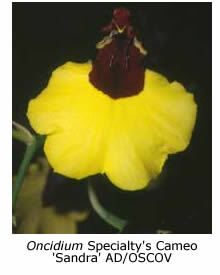 It is often said that oncidiums sometimes flower themselves to death. It happens with pot-grown plants that are over-watered, leading to a broken-down, soggy potting mix and a weak root system. The result is a weak new growth which cannot support its flowering spike. In such cases the spike should be removed and the root system inspected. All dead and soft roots must be removed and the plant repotted in fresh Sphagnum moss, using the smallest pot that will accommodate the plant. The moss should be kept just moist until new roots appear, which may not occur until springtime. There are no magic fertiliser formulae. Any balanced fertiliser, applied at one quarter of the manufacturer’s recommended concentration at alternate waterings, is sufficient. If the roots turn brown and the root tips die, the fertiliser is too concentrated. Its strength should either be reduced or the plants watered immediately before they are fertilised. Conclusion. No orchid collection is complete without a couple of plants of this showy genus. Observation, followed by speedy action, is the key to good culture and will lead to good flower production and great satisfaction.